Home / British Wool / Blue Faced Leicester / Flockfest, here I come! So, it’s Yarn Shop Day tomorrow (Saturday 12th May) and I’m exhibiting, along with lots of other dyers and purveyors of buttons etc, at Flockfest at Flock on the Plain in Woodbury in Wiltshire. To say I’m excited, is to significantly understate how I’m feeling. I thought I’d give you all a preview of some of the hand dye British wool I’m taking with me. I have totally fallen I love with these Blue Faced Leicester sock weight mini skeins. They are such a lovely pop of colour. They are 80 meters/20g each and are sold in sets of five. They are spun with a high twist so are perfect for socks. I’m also taking a Blue Faced Leicester/Nylon Sock weight mix with me. Basically this is for the Nervous Nellies who don’t believe a yarn is strong enough for socks without nylon (although I do love it too and am making socks from it at the moment). This is also spun with a high twist and is sold in 100g hanks. I’m also taking my Audacious base in DK and 4ply weights. This Wensleydale yarn has such a lovely lustre and I particularly love the ply on the 4ply weight. It will be lovely made into shawls. Both the DK and the 4ply are sold in 100g hanks. Lastly, this is my Saucy DK base. This yarn come from Dorset Horn sheep, a breed listed as threatened on the Livestock Conservancy watchlist, so I’m particularly excited to be showing this. I just can’t describe how well this yarn takes a dye. Look at the pics to see what I mean. 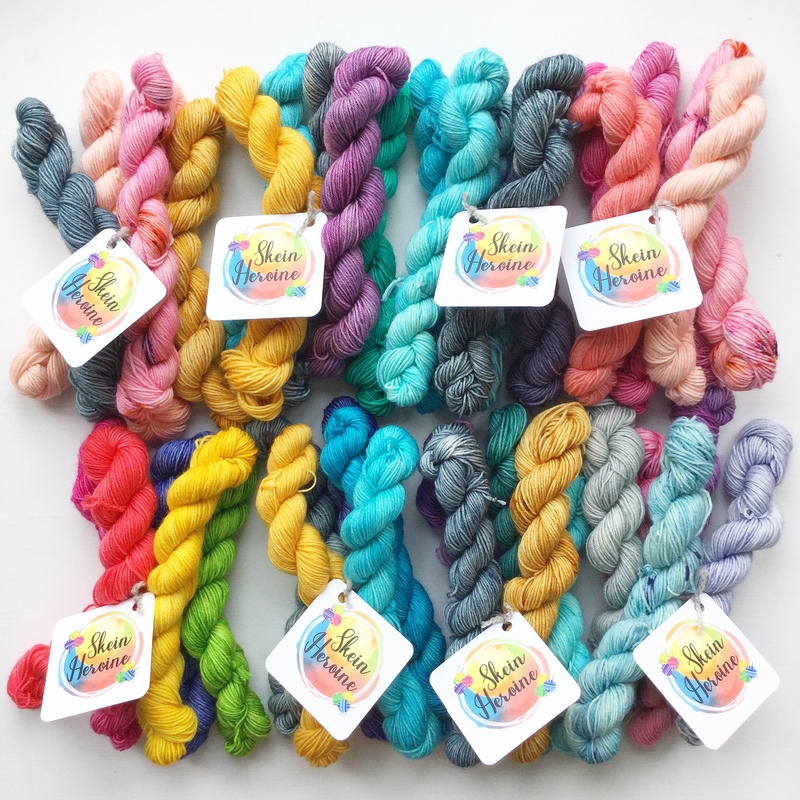 I’ve just dyed up a few skeins of this yarn currently but I plan to dye up a some sweater quantities as I think it will make lovely garments. So, if you are local to Woodborough in Wiltshire do come and squish the yarn. It will be lovely to see you.